Whether you're a student leader, an advisor, a member of an existing organization or looking to start a new one: here's where you'll find everything you need to know about student organization events, policies, procedures, services, and resources. With more than 300 different student organizations at SDSU, there's guaranteed to be something here for you! What are student organizations all about? SDSU's student organizations cover a wide range of interests and involve all sorts of students. You might be interested in recreation, honors societies, cultural groups, professional development organizations, multicultural societies—or maybe starting your own student organization. 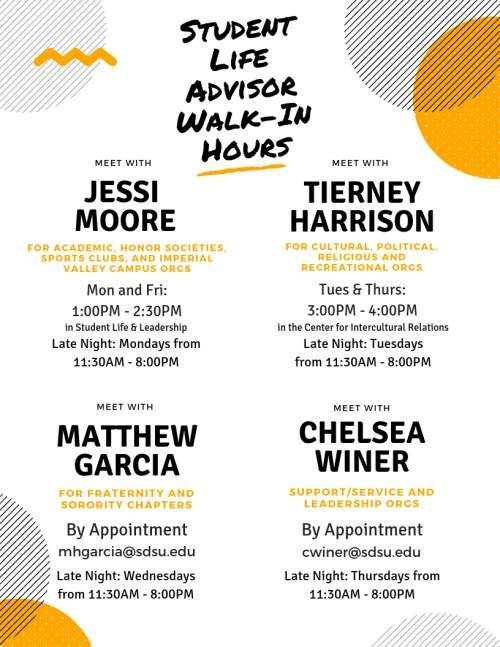 Whatever your interest, you'll find information about how to get involved through SDSU's Student Life & Leadership office. Check out the SLL events page for latest SDSU news & events! SDSU's Student Life & Leadership office has a dedicated Student Organization Team. We provide consultation on campus policies and procedures, and we help with event planning, fundraising, organization development and management, and much more. We collaborate across campus with students, faculty, staff, advisors, Associated Students — the entire campus community — to better serve you. RSO Application Steps for Approval on Biteable. For full details on the recogntion process, please visit Start or Renew and Organization. In order to renew your student organization you MUST complete the new A.S. Banking and Finance sections in the RSO application. Be sure to also "Agree" to the Confirmation of Banking Information by checking the appropriate box. You cannot submit your RSO application without completing this step. A.S. will be offering Banking Training Sessions in Spring 2018 for student organizations. The training sessions will walk you through the A.S. banking policies and forms. It is MANDATORY for the President or Treasurer to attend at least one session in the Summer, Fall or Spring semester. Click here for more information regarding A.S. Banking and your student organization.